This site is about an adventure being planned for 2014. Principally, the aim is to explore the lakes and waterways of Russia before sailing around the North Cape of Norway and home to Denmark. The sail is just short of 4,000 nautical miles and will take from late May until early September, essentially – or at least hopefully – the Northern Summer. Much of it will be north of the Arctic Circle, and so benefit from the midnight sun. We are hoping for westerly or southerly winds to help us from Denmark to Russia, Arctic easterlies to take us from the White Sea through the Barents Sea to North Cape, and summer Northerlies to take us at least part of the way down the Norwegian coast. There are hardly any Marinas in Russia, and very few places to fill fresh water or diesel from a pump or tap. Most of the harbours are not especially yacht-friendly. So we will need to be very self-sufficient for the month or so that we are in Russia. Join us for the planning, and give us any advice that you can, even if only from an armchair! Aldarion is a wooden Bermudan Staysail Schooner 38’x 32’wl x12’3″x 5’6″ + bowsprit. Designed by the late Brian Lello and built in Cape Town, South Africa for the first owner Barry Dickensen, who specified a very strong blue water cruising yacht. She was finished in 1990. barry sailed her from South Africa to Brazil and North America, and then to Europe. He crossed the Atlantic several times, and also sailed in the UK and Mediterranean, covering some 12,000nm. She was purchased by John Bryden in 2003, and sailed from England to Scotland via ireland, extensively in Scotland including the Orkney Islands and the Outer Hebrides before crossing to Norway, where she sailed to the Lofoten Islands and back to Denmark. She has sailed in Sweden and Denmark, in all covering some 5,000nm so far. In September 2012, she competed in the series of races that were part of the 25th anniversary ‘Limfjord Rundt’ in Jutland. In 2014, we plan to sail from Skive in Denmark to St Petersburg via the Baltic, and then through the lakes and Belamork canal to the White Sea, the Solovetsky Islands, and Arkangelsk, before returning to Denmark via Kirkenes, the North Cape of Norway and the Norwegian west coast. This is approximately 3,800 nm and we plan to leave Skive around 23 May and arrive back in Skive in early September. This blog is mainly for friends, family, crew, and other people interested in undertaking this or a similar voyage. In it we will try to go through the process of planning as well as including photos and other materials as we go along. Aldarion is registered in Inverness, Scotland. She is currently owned by John Bryden (Scotland-Denmark-Norway) on behalf of the Bryden (Scotland) and Refsgaard (Denmark-Norway) families. Thanks David, Also look at the Gallery Page for some history! Great idea and lovely site….Mary and i look forward to following your adventures! Dear Followers, welcome to these pages. I have updated some pages recently, including Gallery and Planned Route etc. Dear John and Karen. Nice home page! We look forward to follow your exciting adventures. It is very interesting to read about the Russian cities and their history – a world not well known to most people in the “West”. Also interesting to read about your earlier voyages and to see the photos in the gallery. Update following our visit to St Petersburg, 9th to 13th April. Karen and I are back safely after a very interesting and useful trip to St Petersburg last week and weekend. While there we met with Sergey Bazylevich and his wife Larissa as well as with Valdimir Ivankiv, our sailing club representative in St Petersburg and Agent for this trip. Sergey and Larissa have a small company making films and TV programmes on environmental issues. They have their own small boat, have sailed part of the route, and are friends of a friend. Sergey will be our new Russian speaking sailing pilot through Russia, something we are obliged by law to have. We are very happy that he is able to come with us, and hoping that Larissa will also be able to join for some of the time at least. We also looked at the cabins at the central river sailing club in St Petersburg, where Aldarion will be based for a few days. We will put a few pictures of them on this website. They are wooden, and fairly basic, but clean! They have shower & wc, basic fridge and cooker and table/ chairs, and one double and two bunk beds, all in a fairly small space like a Caravan. Linen, cutlery etc. is provided. There is an OK bar and restaurant round the corner, and the metro to the centre of town is about 20 minutes walk, and the trolley bus to town or metro station about 10 minutes. It takes about 10-15 minutes in the metro to the centre. The area has security, and is quite safe. This is for any extra days you need in St Petersburg, of course when or rather if the boat is double booked! Another alternative might be the fairly low cost hotel we stayed in- the Azimut. It has a great rooftop bar/cafe with good views over town. Fairly basic, but OK. Not too central – metro about 20 mins walk away, but then only 2 stops to the centre (distances between stations are large!). There is also a trolley bus to the metro station if feet sore! On a large and pleasant canal. Taxis are fairly inexpensive. We had a very good meal at CAT, a Georgian restaurant/ cafe with only 8 tables. We also went to the ballet at the new stage, which is fantastic. There is a lot going on in St Petersburg all the time! Even a Scottish festival in February this year! I will try to put some of it on the website. Aldarion goes into the water in Skive, Denmark, today, after wintering in her shed at Lars & Helle Klok’s Værftet. She seems to be in good shape, and one or two adjustments have been made in preparation for our long trip of about 4,000 miles this summer. I’ll spend some of this weekend and a few days next week helping to prepare her. I added some more links on weather and routing today. We (John, Alasdair and Cathel) will gather next week in Skive, Denmark, and intend to set off on the voyage on friday 23rd may, am. Have a nice trip4 I just remembered your plan and started search about this trip! Thanks Pal! Hello to Nora and the family from Visby in Gotland. We hope to leave for Helsinki tomorrow. keep up to date with us on ‘Follow Us’! We are now in Visby, Gotland. Nice to mest you in Mehamn. It was nice to follow your adventures, and I deeply agree with your conclusions! Have some rest! I hope to hear your stories of this trip over some deep red Hungarian wine! Thanks Pal! We will enjoy that, and hope to get to Hungary soon! All please note that the blog is now bank up to date, we are safely back home in Skive, Denmark after just over 4000 nautical miles and about 3.5 months of sailing. Gill has also added more on the leg to Bødø in Arctic Norway, where the weather was often wonderful! But not always! We wish all our followers a very happy christmas and all the best for 2015. We hope to be able to write a guide to sailing to, through, and along the kola peninsula to Norway in 2015, and already have some other sailors who have done this route as potential collaborators, as well as some ‘locals’. In 2016 we may try to take the route from St Petersburg to the Black Sea, but this will depend on the political situation in Crimea/ Ukraine. Hi – a friend forwarded this to me. Hi Ayn, lovely to hear from you. I bought the boat from Barry after he sailed it to Plymouth, and we had a few test sails together. Your uncle wrote to me about the sad news of his death. I still have all the plans for Aldarion, and the photos of her building, including some of yourself. I think Barry told me that you had chosen a career at sea and I hope it has been satisfying. Barry also told me about sailing through the edge of that hurricane! Well, I have been sailing her from Dartmouth to Scotland, in Scotland and the Orkney islands and then in Scandinavia, which after long preparation we circumnavigated last year, taking the route through Russia from St Petersburg to The White Sea and then around North Cape. Our good friend Charlotte Wilkinson is sailing the route this year from Narvik to St Petersburg, but the other way around. I spoke to her a couple of days ago when she was sitting out a gale in Tromso. Send more news to me at jmbryden08@gmail.com and thanks again for the post! First of all, Aldarion is regrettably FOR SALE. See the website of http://www.woodenships.co.uk where Peter and Richard Gregson are the brokers. I bought her from them 13 years ago when the first owner (and builder) the late Barry Dickinson decided to sell her. We are selling because we need a larger, better insulated, better heated yacht to live aboard in northern Scandinavia while doing extensive cruising and working there over the next few years. This we have now acquired in the form of a 1992 Haalberg Rassy 49. Aldarion is in excellent shape. Good friends Charlotte Wilkinson and Svarte Svartling came for a sail in May, in the Limfjord, Denmark, and we had four of the five sails up on a Force 5, making 8-9 knots often. She was painted and varnished last autumn, and is ‘ready to go’ anywhere! Dear Aldarion followers. It has been a very busy time all round since I last commented on this blog. The reason is that Karen and I moved to live in Stockholm this summer. In order to do so, we bought a larger yacht – a nice Haalberg-Rassy 49 – to live on, and we are now in Wasahamnen, Stockholm. A very wonderful place to be, with some nice winter residents, and good facilities (new, and soon to open!). Aldarion is therefore, and reluctantly, for sale! And the price is definitely negotiable, so do contact us if you are interested. She has been a wonderful boat for us, since 2003, but not well enough insulated to live aboard in Sweden in winter. The sail here was wonderful. We bought the boat in Hindeloopen, the netherlands (Isselmere), and sailed her to the Limfjord in mid June via the Freisian islands, Keil canal, and the eastern coast of Denmark. This took us about a week. Then in August we sailed from Skive in the Limfjord to Stockholm, via the south coast of Sweden and calling by Visby, Gotland. We took the beautiful Stockholm archipelago slowly in wonderful weather. Charlotte Wilkinson and I are now working on updating the Cruising Assoctiation guide to sailing in Baltic Russia, with Vladimir’s help, and hope to finish by November. Aldarion is reluctantly FOR SALE. 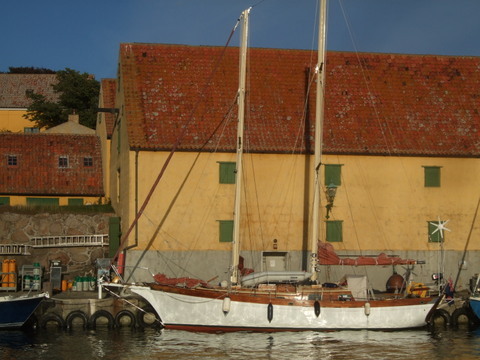 She is in very good shape, and is dry insider her shed in Skive, masts and rigging off for winter. We had to acquire a larger and warmer boat to live aboard in Scandinavian winters – she is a Haalberg Rassy 49, built in 1992 on Orust in Sweden, and a fine sailing ship, name of ‘Svalen’ or ‘Swallow’. Call me on +46709262822. More details about Aldarion on the woodenships.uk website. However, we are willing to negotiate on price. At last we are leaving Stockholm tomorrow for the first stage of our long sail to Brazil and back in 2018-19. Please follow us by going to the website at https://sailingwithsvalen.wordpress.com and going to the Facebook link. We wish you that always (ok. most of the time) the right wind blow your sails. Greatings from Toscana! Thank you Nora and Pal! I noticed you used to own the Fife Colena… my partner and I are going to see her at the weekend with a view to buying her for a liveaboard that we can travel with. Can you tell me anything about how she sails? I’m used to classic wooden boats, but have never sailed a ketch. Do you have any advice or thoughts on her? Many thanks – your blog is a great read, I’ve spent a long time going through it! Hi Sally, I replied to you by email, but if you did not receive it, post on this site again. By the way, with the mizzen up, Colena would lie straight to wind at anchor in a blow.